It’s been an administrative morning. I spent 45 minutes on the phone with the IRS, mostly on hold, straightening out a mistake on their part. Then I tackled the paperwork to enroll my oldest in camp. Last summer was my first summer as a SAHM, and I sort of winged it. I am a big fan of summer, and I thought the kids and I would just have a lot of fun going to the town pool, playing in the backyard, and going on various field trips of our own invention, and last but not least spending two weeks at the beach. To round things out, I signed my oldest up for a weekly art class in August. I also had a high school girl come a few hours a week for a few weeks. As far as I remember, that’s mostly how it went, but I feel like I was a giant ball of stress the entire time. Trying to keep a 6-year-old, 3-year-old and almost 2-year-old happy and safe at the pool, for instance, turned out to be impossible by myself. I could only take two out of three. Field trips consisted mostly of going to Target. I honestly can’t remember if we went anywhere special. Our beach vacation was really fun, and packed full of activity — boating, fishing, visits from friends, beach, boardwalk, nights out for the grown-ups. The smartest thing I did all last year was hire a local girl to come over nearly every day of our vacation to help for a few hours. She mostly watched my daughter, who did not like the beach, which allowed the rest of us to enjoy it. She also made the grown-ups’ nights out possible. My husband made a big effort to keep his work from impacting our vacation, which I appreciated, but he did have to leave and go home a few times. When we were not on vacation, he was extraordinarily busy. So flash-forward to this summer: what has changed? My expectations, certainly. I have joined the legions of mothers who just spend the summer praying for fall to get here. I have come to accept that summer is not necessarily fun for grown-ups, and that is OK. I can’t fully explain it, but that is a huge paradigm shift for me. I guess I was just putting a lot of pressure on myself, and now I have (like Elsa) let it go. My husband remains crazy busy and my kids are older but still mostly crazy. Not much has changed there. So I want this summer to be a little more structured. Enter the idea of camp. My oldest is now signed up for a local day camp for the last week of June and the first week of July. Just keeping him separated from his brother and sister for a while will make life easier for me. He will most likely know kids at this camp and they will get to go to the town pool, so I think he will like it. So in a sense, I’ve extended the normal pleasant routine of the school year by two weeks. Now the rest of July… I’ve designated July as last-minute Jersey shore rental month. In which we study the weather forecasts and my husband’s business situation and pick a week or a few days to stay at the Shore at the last minute. In the past, I needed a full week just to pack for a trip like that, but now that the kids are older and require less specialized equipment (pack-n-play, bottles, baby food), I think I can pull off a quick pack. I also am (seriously!) going to plan some day trips, both educational and splash-tastic. Maybe I will designate a day, like Wednesday, for trips. I know this sounds like overthinking, but if I don’t force myself to some kind of schedule, we will never go anywhere, because it can be so hard sometimes just to get everybody ready and out of the house. 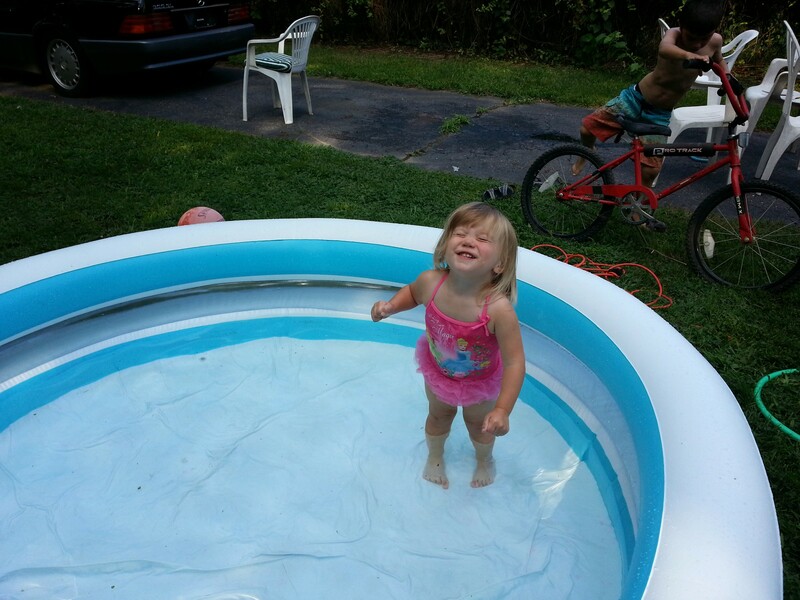 July is also probably going to call for some kind of pretty awesome blow-up pool for our backyard, gallons of mosquito repellant, buckets of sidewalk chalk, new water guns, water balloons, and six cases of Flavor Ice pops. Also, I need to cut a child-size doggy door in the wall next to the back door, so I don’t hear the screen door slam every five minutes all summer long. I might also incorporate some official learning time into the day. Not so much because I think my oldest needs it, but just to have something to do and because my middle child is getting into the idea of school and homework and thinks it’s fun. I know there’s a million worksheets and such we can print off the Internet. In fact, I think anytime we are at home and not away, we are going to have to have a pretty strict schedule as far as when we get up, when meals are served, when naps are taken, when TV is allowed, and when bedtime is, as opposed to last summer. The whole last week of July is reserved to pack and plan for our Vermont vacation the first week of August. More on that later, but that’s one week taken care of. The last three weeks of August I’m going to give over to school shopping, school forms, doctor’s appointments, mentally prepping my middle kid for pre-K, and just wallowing. I am not even going to pretend it’s still summer. I’d love to hear what activities/supplies/trips you have planned for summer. Sounds like a plan! Now that you have a full year under your belt as a sahm, you know how to temper your expectations with the reality of entertaining multiple children! I only have two, but some of their specific needs makes it feel like I have 4 kiddos. lmao I have always found structured routines to be most helpful, but my training as a teacher has instilled that in me. Memberships to the zoo and Please Touch Museum are great for field trips. The membership usually allows me to bring along another mom and her kiddos (for free) so that we can share the responsibilities of chasing and caring for each others’ kiddos. We also have plenty of therapy appointments to keep us moving and grooving. A new idea I have begun to implement are themed busy bins. I have chosen a few books, and have made/gathered materials to do some activities related to the book (mostly found on Pinterest). We read the book and then do an activity related to/extending the book. I have two bins completed, Brown Bear by Eric Carle and Pete the Cat and his Four Groovy Buttons. We don’t do many playdates, because I get really anxious about my kiddos’ quirks, but we try. You and your little ones are always welcome to join us! My sister just bought a house with a big backyard, so we have planned some visits to Auntie Jax’s in NJ too! Here’s to summers as a sahm! Oh, and I can’t forget my tradition of a good book and a gin and tonic on Friday nights after everyone has gone to bed! That’s my treat! Oh, the late-night treat is essential for SAHMs! 🙂 I definitely want to do the zoo and Please Touch. I also saw an article about a really awesome playground in Doylestown that has this giant play structure. I think my biggest problem is the age gap between N&F and T. They can’t do all the things that he can do. I’m lucky in that my dad and in-laws are retired and they can take T places. Thanks for the ideas and I would love to get together!